The Cathedral of Bern as it’s popularly called is Switzerland’s biggest and oldest cathedral from the Late Middle Ages. A magnificent church you should not miss out on, don’t miss out on the huge stained glass window masterpiece, the most popular one being the Dance of Death. There are two highlights of the Bern Cathedral- the depiction of the Last Judgment, with over 200 figures above the altar. 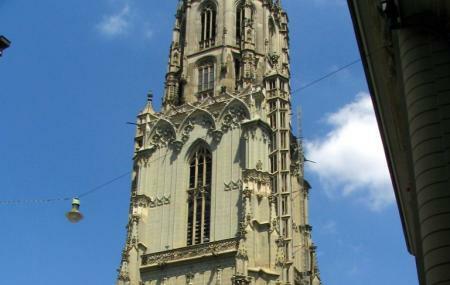 The second highlight of the Munster is the 100 meters church tower that stands tall and dictates the Bern skyline. Beautiful vistas of Bern await all those brave enough to conquer the 270 steps it takes to scale the tower. Switzerland’s biggest and oldest cathedral is definitely of interest when one visits this beautiful country. Since it’s a religious site, there are no tickets for Cathedral of Bern, however, booking up a tour gives you the advantage of a hassle-free entry into the church. The best way to explore this majestic cathedral is to buy tickets for Cathedral of Bern tours and leave every worry. Cathedral of Bern tickets are always in demand given the magnanimity of this structure. You can scroll down further to know Cathedral of Bern ticket prices for tours to pick up the best for you. Last entry to the steeple is half an hour before the church closes. While entry to the cathedral is free, entry to the steeple costs CHF 5 for adults and CHF 2 or children. How popular is Cathedral At Munsterplatz? People normally club together Bear Park and Bern Historical Museum while planning their visit to Cathedral At Munsterplatz. This is an outstanding cathedral, in a beautiful city, with phenomenal views. There is a fee to climb the stairs to view Bern and the surrounding region from the top of the building, and I have been told it is worth it. It is grand inside with ornate decorations including spectacular stained glass windows and an amazing organ. As you would expect, you can light a candle for loved ones for a small donation. Loved it. Amazing, truly wonderful. The architecture inside is amazing and well done. It’s free to go in, and that’s a surprise in Switzerland. Most important, outside from all the pieces of art in this gigantic Cathedral, is going up the stairs for what may be the best possible view in Bern. It’s a must see in Bern! Really beautiful curch, if you're in Bern I'd definitely recommend to check it out. The view from the tower is amazing as well! Just a must do while in Bern. Impressive Church from the outside and stunning views and today we even saw the alps.